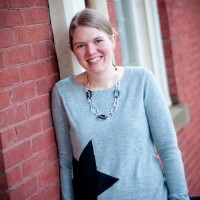 The first Chasing Supermom Book Club meeting is right around the corner. I am SO excited to be able to interact and connect with you as we discuss a book together. There is something magical about a shared literary experience. (Yep, I’m a certified book nerd.) I had a tough time narrowing down the choices. I like many of you, haven’t made enough time to read…(other than Goodnight Moon and Matilda..) and there were SO many titles out there I wanted to explore. Knowing the Chasing Supermom audience is a diverse group of women, and I tried to select a variety of genres and themes, hoping at least a few titles would pique your interest. What’s missing from the list? Children’s books! While a mom may make time to read a chapter or two of Diary of a Wimpy Kid to her fourth grader, what she won’t do is make time for herself! So, with the exception of two YA novels, the selections are books written for YOU…not your kids. Moms are amazing beings. We can multi-task like nobody’s business, organize and manage multiple lives, and nurture away bad dreams, scrapes, and fears. But, moms stink at valuing their needs and making time for themselves. Let this be about you. Also not on the list? Parenting books. Not a fan. “But, you’re all about providing ideas and encouragement for moms!” Exactly. The last thing any of you need is to read polarizing opinions on parenting, when we all know there are many successful ways to parent. What I think moms really need is time, enjoyment, and the freedom to relax doing something they love. I hosted a book club a few years ago. After a year or two, we “broke up.” People got “too busy.” When we find ourselves too busy to read one book a month, we’ve written ourselves out of our own life. Ladies, whether this book club is your “thing” or not, I urge you to make the time to pursue something YOU enjoy. Give yourself the freedom to spend half an hour a day on yourself. Run. Scrapbook. Paint. Read. Do something just for you. And now, it’s time to meet the finalists..(Why does that sounds like a pageant introduction?) Read through the descriptions, and see what jumps out at you. You’ll have the opportunity to vote for your top three picks. The book with the most votes will be our first selection. 1. 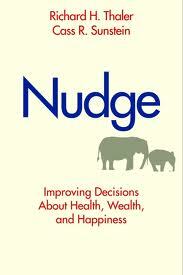 Nudge: Improving Decisions About Health, Wealth and Happiness by Richard Thaler Nudge is about choices—how we make them and how we can make better ones. Drawing on decades of research in the fields of behavioral science and economics, authors Richard H. Thaler and Cass R. Sunstein offer a new perspective on preventing the countless mistakes we make—ill-advised personal investments, consumption of unhealthy foods, neglect of our natural resources—and show us how sensible “choice architecture” can successfully nudge people toward the best decisions. In the tradition of The Tipping Point and Freakonomics, Nudge is straightforward, informative, and entertaining—a must-read for anyone interested in our individual and collective well-being. 2. 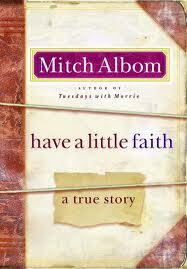 Have a Little Faith by Mitch Albom Albom (Mitchel David “Mitch” Albom) writes in the introduction to this book that the idea for it began with the request by Albert L. Lewis, his childhood rabbi, to write and deliver the eulogy when the time came for the rabbi’s funeral. Albom agreed, contingent on an agreement that he could begin a series of interviews and conversations, in order to get to know Lewis as a man, not just as a rabbi. Albom writes that his conversations with Lewis — whom he refers to as the Reb, an affectionate term drawn from the Yiddish word for rabbi — eventually led to an increased interest on Albom’s part in the power and meaning of faith in a larger sense. In his hometown of Detroit, he forged a link with Pastor Henry Covington, an African-American Protestant minister at the I Am My Brother’s Keeper Church. Covington, a past drug-addict, dealer, and ex-convict, was ministering to the needs of his down-and-out parishioners, in an urban church serving a largely homeless congregation, in a church so poor that the roof leaked when it rained. The book alternates between his conversations with Lewis, and excerpts from some of his sermons; and Life of Henry, the title of the sections describing his conversations with Covington, and stories about him. From his relationships with these two very different men of faith, Albom writes about the difference faith can make in the world. 3. 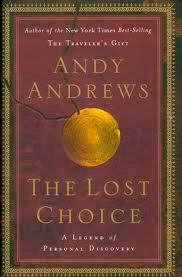 The Lost Choice by Andy Andrews Dorry Chandler is a journalist who has always had a taste for mysteries. Curious about the strange “rock” her son has found, she takes it to Dylan Langford, an expert on antiquities who works at the Denver Museum of Nature and Science. When the language inscribed on the artifact is translated, a far-reaching mystery begins to unravel. This normal family’s life becomes anything but normal as each piece of evidence sheds additional light on the object’s significance. The Chandlers may have unearthed a fragment of one of the most profound relics in mankind’s history and the key to understanding the extraordinary achievements of esteemed men and women throughout time—Joan of Arc, Thomas Jefferson, George Washington Carver, Oskar Schindler—who seem to have been profoundly affected by the message the object bears. What power resides in this seemingly unimportant piece of bronze? Who passed its secrets on through the centuries? And why has the object appeared now, in this way, in this time and place? Weaving a thread of good and evil through history, The Lost Choice follows the story of an ancient relic and offers a parable of the hidden potential of the human heart. 4. 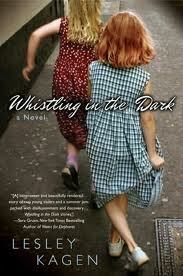 Whistling in the Dark by Lesley Kagen Sally O’Malley made a promise to her daddy before he died. She swore she’d look after her sister, Troo. Keep her safe. But like her Granny always said-actions speak louder than words. Now, during the summer of 1959, the girls’ mother is hospitalized, their stepfather has abandoned them for a six pack, and their big sister, Nell, is too busy making out with her boyfriend to notice that Sally and Troo are on the Loose. And so is a murderer and molester. Highly imaginative Sally is pretty sure of two things. Who the killer is. And that she’s next on his list. Now she has no choice but to protect herself and Troo as best she can, relying on her own courage and the kindness of her neighbors. 5. 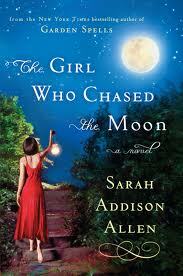 The Girl Who Chased the Moon by Sarah Addison Allen In her latest enchanting novel, New York Times bestselling author Sarah Addison Allen invites you to a quirky little Southern town with more magic than a full Carolina moon. Here two very different women discover how to find their place in the world—no matter how out of place they feel. Emily Benedict came to Mullaby, North Carolina, hoping to solve at least some of the riddles surrounding her mother’s life. Such as, why did Dulcie Shelby leave her hometown so suddenly? And why did she vow never to return? But the moment Emily enters the house where her mother grew up and meets the grandfather she never knew—a reclusive, real-life gentle giant—she realizes that mysteries aren’t solved in Mullaby, they’re a way of life: Here are rooms where the wallpaper changes to suit your mood. Unexplained lights skip across the yard at midnight. And a neighbor bakes hope in the form of cakes. Everyone in Mullaby adores Julia Winterson’s cakes—which is a good thing, because Julia can’t seem to stop baking them. She offers them to satisfy the town’s sweet tooth but also in the hope of rekindling the love she fears might be lost forever. Flour, eggs, milk, and sugar . . . Baking is the only language the proud but vulnerable Julia has to communicate what is truly in her heart. But is it enough to call back to her those she’s hurt in the past? Can a hummingbird cake really bring back a lost love? Is there really a ghost dancing in Emily’s backyard? The answers are never what you expect. But in this town of lovable misfits, the unexpected fits right in. 6. Good Things Happened Today by Christopher Atwood A dynamic inspirational fiction about personal growth and development.” Good Things Happened Today will inspire you to be a better person, to live a better life, uniquely blending spiritual connection and philosophy with action and adventure. If you have ever reflected on the purpose and meaning of your every day life, Good Things Happened Today is a must read for you. When a self-consumed, obsessive materialist is thrust into the hands of Noah, a homeless divinity living in Central Park, the trajectory of his life is changed forever. Together, they embark upon a fantastic journey of transformation and enlightenment. More than just a story of individual growth and perspective, Good Things Happened Today chronicles the intersection of multiple lives in the battle between good and evil. Unveiled through a series of supernatural events, the course of humanity hangs in the balance, shaped and determined by the choices our characters make along the way-created by the choices we make each day. 7. 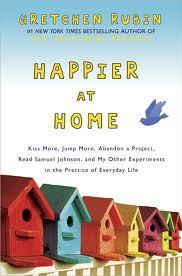 Happier at Home: Kiss More, Jump More, Abandon a Project, Read Samuel Johnson, and My Other Experiments in the Practice of Everyday Life by Gretchen Rubin One Sunday afternoon, as she unloaded the dishwasher, Gretchen Rubin felt hit by a wave of homesickness. Homesick—why? She was standing right in her own kitchen. She felt homesick, she realized, with love for home itself. “Of all the elements of a happy life,” she thought, “my home is the most important.” In a flash, she decided to undertake a new happiness project, and this time, to focus on home. And what did she want from her home? A place that calmed her, and energized her. A place that, by making her feel safe, would free her to take risks. Also, while Rubin wanted to be happier at home, she wanted to appreciate how much happiness was there already. 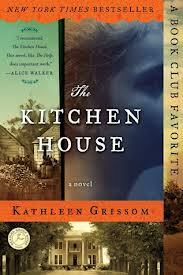 8.The Kitchen House by Kathleen Grissom When a white servant girl violates the order of plantation society, she unleashes a tragedy that exposes the worst and best in the people she has come to call her family. Orphaned while onboard ship from Ireland, seven-year-old Lavinia arrives on the steps of a tobacco plantation where she is to live and work with the slaves of the kitchen house. Under the care of Belle, the master’s illegitimate daughter, Lavinia becomes deeply bonded to her adopted family, though she is set apart from them by her white skin. Eventually, Lavinia is accepted into the world of the big house, where the master is absent and the mistress battles opium addiction. Lavinia finds herself perilously straddling two very different worlds. When she is forced to make a choice, loyalties are brought into question, dangerous truths are laid bare, and lives are put at risk. The Kitchen House is a tragic story of page-turning suspense, exploring the meaning of family, where love and loyalty prevail. 9. 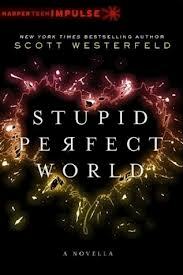 Stupid Perfect World by Scott Westerfield In this future-set novella by bestselling author Scott Westerfeld, Kieran Black lives in a “perfect” world. Disease and starvation have been eradicated, sleep is unnecessary, and it takes no time at all to go from the Bahamas to the moon. But now Kieran has to take Scarcity, a class about how people lived in the bad old days. And as if sitting through an hour of Scarcity every day wasn’t depressing enough, it’s final projects time. Each student must choose some form of ancient hardship to experience for two whole weeks. Kieran chooses having to sleep eight hours a night, which doesn’t seem too annoying. Maria Borsotti has never thought much of Kieran, but she decides to take pity on him and help him out with his project. Soon, Kieran is sleeping and having vivid dreams, while Maria, whose Scarcity project is to give up all teenage hormone regulation, is experiencing emotions she never knew she had. As their assignments draw them closer together, they begin to wonder if the olden days weren’t so bad. Maybe something has been missing from their perfect lives after all? 10. Divergent by Veronica Roth In Beatrice Prior’s dystopian Chicago world, society is divided into five factions, each dedicated to the cultivation of a particular virtue—Candor (the honest), Abnegation (the selfless), Dauntless (the brave), Amity (the peaceful), and Erudite (the intelligent). On an appointed day of every year, all sixteen-year-olds must select the faction to which they will devote the rest of their lives. For Beatrice, the decision is between staying with her family and being who she really is—she can’t have both. So she makes a choice that surprises everyone, including herself. During the highly competitive initiation that follows, Beatrice renames herself Tris and struggles alongside her fellow initiates to live out the choice they have made. Together they must undergo extreme physical tests of endurance and intense psychological simulations, some with devastating consequences. As initiation transforms them all, Tris must determine who her friends really are—and where, exactly, a romance with a sometimes fascinating, sometimes exasperating boy fits into the life she’s chosen. But Tris also has a secret, one she’s kept hidden from everyone because she’s been warned it can mean death. And as she discovers unrest and growing conflict that threaten to unravel her seemingly perfect society, she also learns that her secret might help her save those she loves . . . or it might destroy her. 11. 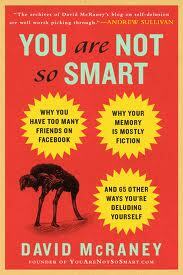 You Are Not So Smart: Why You Have Too Many Friends on Facebook, Why Your Memory Is Mostly Fiction, and 46 Other Ways You’re Deluding Yourself by David McRaney Whether you’re deciding which smartphone to purchase or which politician to believe, you think you are a rational being whose every decision is based on cool, detached logic. But here’s the truth: You are not so smart. You’re just as deluded as the rest of us—but that’s okay, because being deluded is part of being human.Growing out of David McRaney’s popular blog, You Are Not So Smart reveals that every decision we make, every thought we contemplate, and every emotion we feel comes with a story we tell ourselves to explain them. But often these stories aren’t true. Each short chapter—covering topics such as Learned Helplessness, Selling Out, and the Illusion of Transparency—is like a psychology course with all the boring parts taken out. Bringing together popular science and psychology with humor and wit, You Are Not So Smart is a celebration of our irrational, thoroughly human behavior. 12. The Sociopath Next Door by Martha Stout In the pages of The Sociopath Next Door, you will realize that your ex was not just misunderstood. He’s a sociopath. And your boss, teacher, and colleague? They may be sociopaths too. We are accustomed to think of sociopaths as violent criminals, but in The Sociopath Next Door, Harvard psychologist Martha Stout reveals that a shocking 4 percent of ordinary people—one in twenty-five—has an often undetected mental disorder, the chief symptom of which is that that person possesses no conscience. He or she has no ability whatsoever to feel shame, guilt, or remorse. One in twenty-five everyday Americans, therefore, is secretly a sociopath. They could be your colleague, your neighbor, even family. And they can do literally anything at all and feel absolutely no guilt. How do we recognize the remorseless? One of their chief characteristics is a kind of glow or charisma that makes sociopaths more charming or interesting than the other people around them. They’re more spontaneous, more intense, more complex, or even sexier than everyone else, making them tricky to identify and leaving us easily seduced. Fundamentally, sociopaths are different because they cannot love. 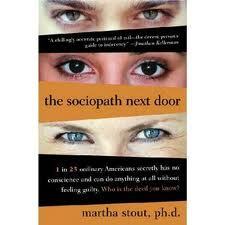 Sociopaths learn early on to show sham emotion, but underneath they are indifferent to others’ suffering. They live to dominate and thrill to win. 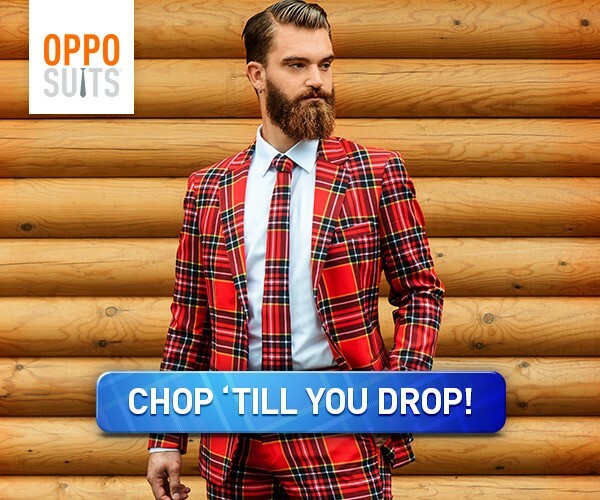 The fact is, we all almost certainly know at least one or more sociopaths already. Part of the urgency in reading The Sociopath Next Door is the moment when we suddenly recognize that someone we know—someone we worked for, or were involved with, or voted for—is a sociopath. But what do we do with that knowledge? To arm us against the sociopath, Dr. Stout teaches us to question authority, suspect flattery, and beware the pity play. Above all, she writes, when a sociopath is beckoning, do not join the game. It is the ruthless versus the rest of us, and The Sociopath Next Door will show you how to recognize and defeat the devil you know.